We recommend checking out our discussion threads on the HP 12.5" Pro x2 612 G1 128GB Tablet with Power J8V71UT#ABA, which address similar problems with connecting and setting up iPads & Tablets HP. The user manual for the HP 12.5" Pro x2 612 G1 128GB Tablet with Power J8V71UT#ABA provides necessary instructions for the proper use of the product Computers & Solutions - iPads & Tablets. The HP 12.5" Pro x2 612 G1 128GB Tablet lets you stay productive when traveling and includes HP's Power Keyboard, so you can have a notebook experience in or out of the office. This tablet comes with an Intel Core i3-4012Y processor and 4GB of DDR3L RAM to run the pre-installed Windows 8.1 Pro operating system along with your applications at the same time. To access your files quickly, HP has built this tablet with a 128GB solid-state drive that consumes less power and is faster than a typical hard drive. Moreover, an integrated microSDXC card slot lets you expand the tablet's storage capacity with an optional memory card. HP has designed this 12.5" display with 10-point touch technolog, so you may rotate, pinch, swipe, and other useful functions with your apps. Powered by integrated Intel HD 4200 graphics, the IPS screen offers a resolution of 1920 x 1080 along with accurate colors. To complete the multimedia experience, two built-in speakers are enhanced with DTS Sound+ technology for immersive audio. You can take 5MP photos using the back camera or utilize the front 1080p HD camera and dual-array microphones to keep in touch with everyone via video calls. Accessing the Internet can be achieved wirelessly with the dual-band 802.11ac Wi-Fi module. Additionally, Bluetooth 4.0 lets the tablet connect with Bluetooth-enabled speakers or other peripherals. Aside from these features, this tablet is equipped with a smart card reader, a USB 3.0 port, and a combo audio jack. The full-sized, spill-resistant Power Keyboard includes a touchpad with two-finger support and is completely detatchable. It offers you connectivity options for your displays and headsets by including a DisplayPort and VGA port as well as a combo headphone/microphone jack. For your printers and external storage devices, two USB 3.0 ports are available and one of these ports features USB charging for a battery-powered device. There's also an integrated Gigabit ethernet jack, so the tablet can access the network reliably and quickly. In addition, a built-in 2-cell Lithium-ion polymer battery extends your on-the-go lifestyle. If you own a HP ipads & tablets and have a user manual in electronic form, you can upload it to this website using the link on the right side of the screen. The user manual for the HP 12.5" Pro x2 612 G1 128GB Tablet with Power J8V71UT#ABA can be downloaded in .pdf format if it did not come with your new ipads & tablets, although the seller is required to supply one. It is also quite common that customers throw out the user manual with the box, or put the CD away somewhere and then can’t find it. That’s why we and other HP users keep a unique electronic library for HP ipads & tabletss, where you can use our link to download the user manual for the HP 12.5" Pro x2 612 G1 128GB Tablet with Power J8V71UT#ABA. 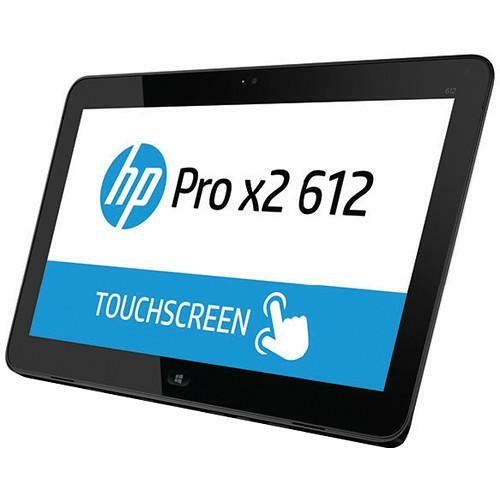 The user manual lists all of the functions of the HP 12.5" Pro x2 612 G1 128GB Tablet with Power J8V71UT#ABA, all the basic and advanced features and tells you how to use the ipads & tablets. The manual also provides troubleshooting for common problems. Even greater detail is provided by the service manual, which is not typically shipped with the product, but which can often be downloaded from HP service. If you want to help expand our database, you can upload a link to this website to download a user manual or service manual, ideally in .pdf format. These pages are created by you – users of the HP 12.5" Pro x2 612 G1 128GB Tablet with Power J8V71UT#ABA. User manuals are also available on the HP website under Computers & Solutions - iPads & Tablets.